we’ve had yogurt and kimchi and veggies (with a hearty helping of bread, but let’s ignore that, shall we?) the past 2 weeks on the blog, so it’s time for butter and chocolate and warmth. and swimsuit season is a good 4 months away, so who cares? or for people who lounge around in workout clothes all day and think yoga pants are dressy and never swim, who cares? join me in this butterfest. 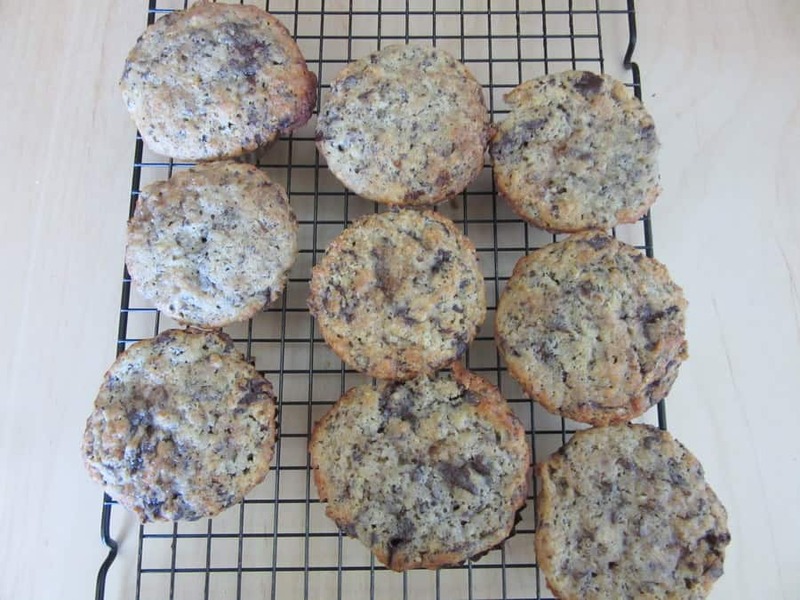 these chocolate chunk muffins have a crunchy cookie-like top from the raw sugar, and a moist muffin underneath. it was incredibly moist, but not at all gummy. so buttery! only 1 T butter per muffin, lols. i think that’s one of their main secrets to amazing baked goods: stuff as much butter as possible in. despite the amount of salt, they actually weren’t salty at all (fine by me!). they weren’t as almondy as i might have wanted, so i’d up the almond meal to maybe 1/2 cup, or add a dash of almond extract. they were perfectly sweet for me (meaning they weren’t that sweet), and i loved all that chocolate. when you eat them warm, there’s molten chocolate pockets and some denser ones. there were 3 of us bakers, so everyone got 4 muffins to take home. my family polished off four, one for each person, by 5pm. mind you that they came out of the oven at 12:30pm, and half of the vultures family was gone at work/school until past 3. mumsies and pops raved about them, and my brother asked why we didn’t make more. i’m not sure what more endorsement you need, but if you want really buttery, moist, crunchy on top and tender in the middle muffins with enough chocolate to make the muffin question its identity (muffin, or mini cake that’s meant more for dessert than breakfast? chocolate or chocolate chunk?) make these. Mix the butter, sugar and salt until light and fluffy. Add the eggs, one at a time. Add everything else. Mix until just incorporated. Spoon the batter into 12 muffin liners. Sprinkle granulated (raw also works well if you want more of a crunch) sugar on top. Bake at 350F for 22 minutes. i love almond meal in cakes/muffins! it makes it a bit more tender (perfect if you like soft insides, which it sounds like you do! ), and adds more nutty/toasty goodness. ooooh. these don’t have a crumb top… yet. but i’m imagining how tasty they’d be with an oaty/nutty/toasty/buttery (add to the butterfest hehe) streusel, and that might have to happen next time i make these! The chocolate chunk muffins look delicious! Everything I want in a morning muffin: enough fiber and yogurt to make me feel like it's acceptable to eat two, and enough chocolate to satisfy my sweet-tooth! yeup these are so cupcake like that you don’t even miss the frosting :3 (though ofc they would be amazing with frosting- who turns frosting down?!? ).